Are you too busy working to spare any time for your development? Then, you’re too busy earning a living to enjoy real and meaningful success! growing. The result is you’re going to get the same results year after year, with only gradual—if any—improvement. hours at work won’t help you. However, changing your mindset and certain habits will. And the best part is, it won’t take a lot of your time and energy to do it. If you’re wondering how that’s possible in just a few minutes a day, think about this…Picture a jar that is half full of murky water. There’s a faucet above it that drips one drop of water into the jar every 30 seconds. What happens to the water over time? The murkiness begins to fade. It’s not noticeable at first, but soon, you can see a difference. The water gets lighter and lighter and eventually it will become clear. It happens according to natural law. Would you like a bigger, better, happier life? Do you know what that would look like for you? Forget about your to-do list for a few moments and let your mind fantasize about how you would really like to live. Think about the kind of life that would make you feel happy and fulfilled. you breathe life into the idea and create a definite plan of action to get it… without working hard. 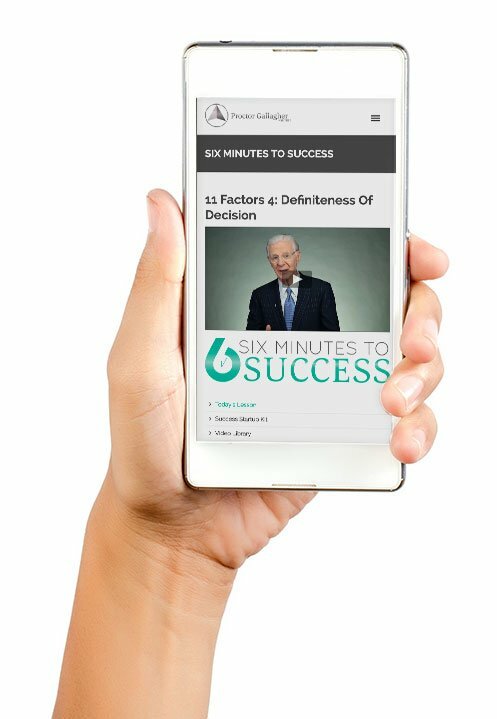 Six Minutes to Success is based on Bob Proctor’s more than 50 years of research into what makes or keeps people from being successful. so it is very difficult to do on your own. paradigm changes, everything in your life changes. To be successful, you must be moving toward something, a worthy ideal. So you’ll get a Success Start-Up Kit that makes setting and progressing toward your goals simple and fun! Every morning, you’ll receive a brand new video from Bob on universal laws, money, health, relationships… anything that will help you enjoy greater success, health and happiness in your life. He’ll also challenge you with a short exercise to stir you into action and start developing habits that move you toward your goal. The objective of the program is to help you think and act differently, and show you how to grow into your purpose and goals. So Six Minutes to Success comes with a workbook called Your Yearlong Plan for Living Your Dream. It is inspiring, thought-provoking and refreshingly challenging. You can use this workbook to set and refine your goals as you move through the process. You’ll also get an Action Planner that makes it easy to stay on track. This Planner is broken down into a 52-week process that follows the guidelines and principles outlined in the Workbook. The Action Planner is delivered in monthly increments. Each month includes information on a Universal Principle and worksheets to help you apply each principle to your life. You’ll have access to a library where you can listen to audio MP3s and review transcripts of every single video during a jog, in the car, on a plane, etc. You don’t have to take this journey alone. There are thousands of people just like you who are changing their lives with this program. You can engage with other members—learn from and about their experiences and share your thoughts and ah-ha moments with them at any time. Success is the direct result of desire and habits that move you toward your goal. If you want to improve any aspect of your life, Six Minutes to Success will provide the information and inspiration you need each day to develop the habits that will create the results you are seeking. This is a system that causes you to re-evaluate and change your personal rules for success. This is a system that leads to the mastery of fear, discouragement, and indifference. This is a system that generates results that stick. Imagine having a place to find the answers to any question life throws at you. Imagine having your dreams come true without having to trade all of your time. Imagine what your life might look like 30 days from now after learning from the best teachers in the world on human potential and success every single day. Imagine starting every day with inspiration motivation and thought-provoking lessons. Imagine achieving your goals without experiencing the struggles of growth and ‘going it alone’. You don’t have to imagine anymore. 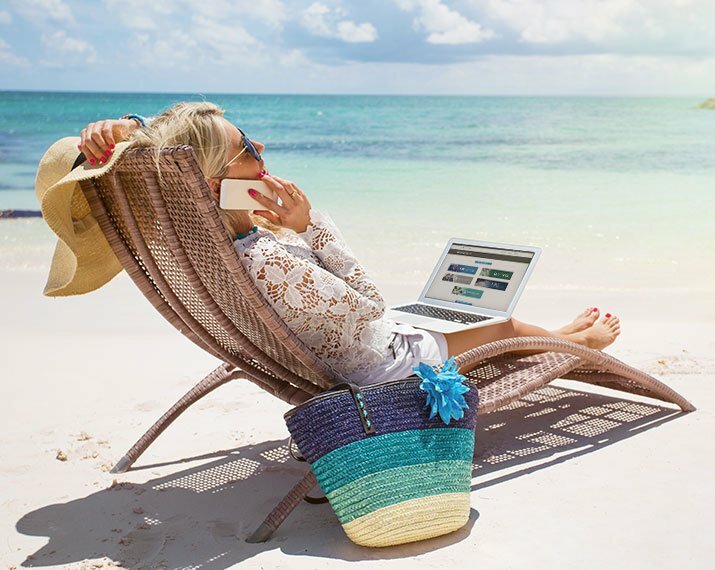 You can join Six Minutes to Success TODAY and start living the life you’ve always dreamed of with ease and enjoyment. As a small business owner I have not found any better tool to help me get motivated and stay on track all day long. Six Minutes has helped me get better nightly rest as my mind wanders into the future possibilities as I contemplate the daily message. After more than two years of daily Six Minutes I can truly say I am a much more positive, energized and educated entrepreneur. This is truly one of the best success tools I have and continue to use on a daily basis. Six Minutes to Success is a great program. It is a great way to start my day with a lesson from the Greatest Teacher I have come across – Bob Proctor. With these lessons I have learned to make use of my positive emotions and am on my way to getting rid of the negative emotions. Six Minutes is a great program for anyone wanting a positive change in their lives. I recommend the Premier Membership to everyone wanting to improve his life in a great way. The daily videos that Bob Proctor has delivered for Six Minutes to Success has been life enhancing. The videos have connected me with many other like minded individuals, who are striving with the same enthusiasm and passion in their life. It has given me the confidence to not be afraid of rejection and to rise above all difficulties and to find miracles that occur in everyday life. Six Minutes to Success sets me up for the day, and props me up when I have those weak moments. If you want to improve the quality of your life, but you don’t have a lot of time to work on it, this is the perfect program for you. Each and every morning you’ll be greeted with a brand new Daily-Featured Six Minutes to Success Video on topics ranging from the laws of the universe, money, health, leadership, relationships and so much more. You’ll be pleasantly surprised at how your daily video is generally the exact message you need to hear that day to get unstuck and make progress on your goal. All you need is six minutes a day to experience extraordinary benefits … leaving you more time to enjoy your increasingly successful life! Bob Proctor has been the foremost authority in the personal and professional development field for more than half a century. He has dedicated his adult life to helping a world of individuals realize and act on the greatness they already possess within themselves. He’s widely regarded as the grandfather of personal development, and when it comes to mastering the mind – he is simply the best. After meeting Bob Proctor, Sandy Gallagher, an esteemed banking attorney, created Thinking Into Results – the most powerful corporate and personal transformational program of its kind. Sandy is now the Co-Founder, President and CEO of Proctor Gallagher Institute. She is a genius businesswoman and visioneering expert committed to improving the conscious awareness of the entire world, one individual at a time. Six Minutes to Success helps individuals at all levels to grow, improve and adapt to the ever-changing nature in today’s world … and most of all create Results that STICK. Every single morning you’ll be greeted with a brand new, Six Minutes to Success Video with topics ranging from the universal laws, money, health, relationships and so much more. We make getting started, and achieving your most important goals simple and fun! If you really want success FAST the Six Minutes goal workbook is inspiring, thought-provoking and refreshingly challenging. Share your thoughts and ah-ha moments with other Six Minutes to Success members through the Facebook comments feed below each and every video – and engage with other members. You get MP3s audios of every single video so whether you’re in the car, going for a jog or waiting for a meeting is success easy and convenient! 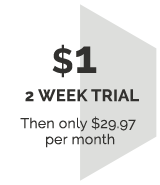 Enjoy a PDF transcript of each daily video to reference back to at any time to study each lesson closely and repetitiously. If you really want success FAST the Six Minutes goal workbook is inspiring, thought provoking and refreshingly challenging. You get MP3s audios of every single video so whether you’re in the car, going for a jog or waiting for a meeting is success easy and convenient!! Gain instant access to all 600+ Six Minutes to Success videos searchable by keyword, category and title. Get your questions answered by Bob himself! Enjoy access to the LIVE monthly Proctor Gallagher Institute Q&A webinar.